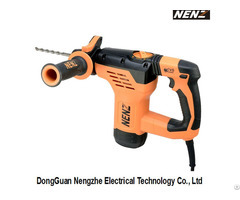 NENZ Electric Technology Company has more than 20 years experience in production of multifunctional rotary hammer . It is a hightech enterprise professionally engaged in the R&D, production, sales, test and service of power tools. Located at the global most innovative and vigorous forefront region, Dongguan City of Guangdong Province. Owing to the international top level design and production, the product quality and property can meet the industrial users' strictest utilization requirements for tools under different kinds of harshly working environments.